Xylon demonstrates 2D and 3D Graphics Processing Units (GPU) for Xilinx Zynq-7000 based products by providing pre-verified reference designs for Xilinx Zynq-7000 ZC702 evaluation board. The reference design includes evaluation logicBRICKS IP cores and hardware design files prepared for Xilinx Platform Studio (XPS) design suite. It also includes complete Linux OS image, software drivers, demo applications and documentation. Click to see a list of deliverables! System designers can leverage the flexibility and scalability of logicBRICKS IP cores and software to speed up their development cycle. Software designers can develop Linux and standalone applications for their product before target hardware is available and hardware designers can customize the provided logicBRICKS designs to closely fit to their requirements. The provided hardware logicBRICKS designs can be also used with other popular operating systems. A number of Xilinx partners who provide different OS Board Support Packages (BSP) for Xilinx ZC702 board supports Xylon logicbRICKS - for more information, please contact us. 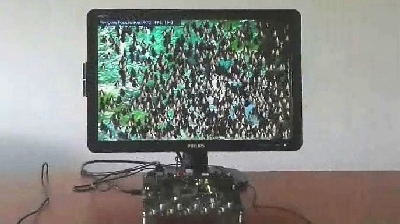 Demonstrates 2D and 3D logicBRICKS graphics on Xilinx ZC702 Evaluation Board with connected PC monitor. Deliverables include complete software support for Linux OS: standard FrameBuffer driver, DirectFB graphics library and full OpenGL® ES 1.1 API. Demonstrates common HMI features: video image capture, touch display control, audio and graphics display. HMI features are supported by the FMC-HMI peripheral board with an integrated high-resolution LCD display. Deliverables include Linux OS image, drivers and demos. Visit us and learn more about new Xylon reference designs: http://www.logicbricks.com/logicBRICKS/Reference-logicBRICKS-Design.aspx. Visit our video gallery and see running demos: http://www.logicbricks.com/logicBRICKS-IP-Library/Video-Galleries/logicBRICKS-Demos-Xilinx-ZC702-Video-Clip.aspx. Product is based on a published Khronos specification, and is expected to pass the Khronos Conformance Testing Process. Current conformance status can be found at www.khronos.org/conformance. Xylon is an electronic company focused on Field Programmable Gate Array (FPGA) design development. It was established in 1995 and is based in Zagreb, Croatia. Xylon offers a comprehensive IP cores library named logicBRICKS, and it is optimized for Xilinx FPGA architectures. Xylon’s expertise in the fields of embedded graphics, video, image processing and networking is confirmed by a large number of successful FPGA designs, which are produced by our partners and distributed worldwide. All of Xylon’s IP cores are exhaustively tested to ensure that they can be easily implemented and integrated in the customers’ designs. Xylon is a Prermier Member of the Xilinx Alliance Program. More information can be found at www.logicbricks.com, the official Xylon web site.